Were you ever trying to find your way to an address you’d never visited before and thought to yourself, “If only this frustrating experience had been gamified!” Your wish has been granted. 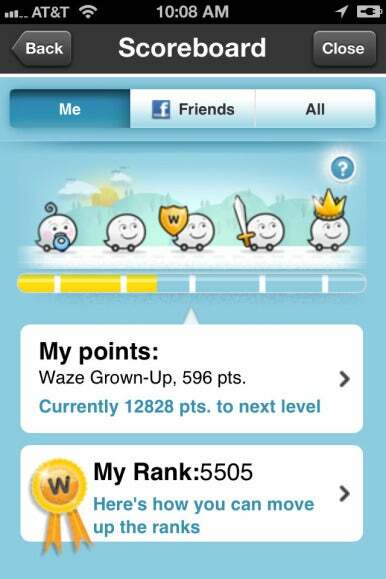 Waze, a free (and quite capable) iOS navigation app, relies on its users to populate its maps and provide automatic and manual traffic reporting—all with an overlay of game playing. Waze navigation shows you the path to your destination, along with streets no one has driven (and by driving will earn you points), as well as problems en route reported by other drivers. Waze tries to motivate drivers to fill in blank areas by offering incentives in the form of Pac-Man-like icons you can gobble up to increase your “score.” In October, for instance, I drove several blocks out of my way, sometimes to the end of dead-end roads, just to eat up pumpkins—one of many seasonal themes Waze rotates through to keep interest active. Anonymous details about the current speed and location of all users are uploaded to the Interent in order to provide data on current traffic conditions. You can also engage in a social network in which you optionally expose your current location. And when stopped, you can file on-the-spot reports about speed traps, accidents, or closed roads. 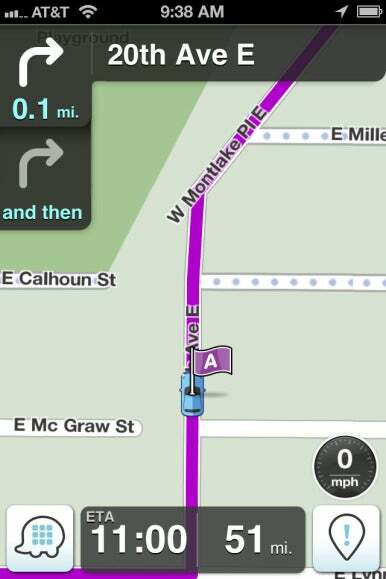 Despite all of that, Waze is only an adequate navigation app. It has a simple interface for entering destinations that’s probably too simple: You can’t just select a contact, but have to type in part of a name. When it finds a destination, you can’t confirm it on a map, nor does it provide a map overview or a way to list turn-by-turn directions from start to finish. You also can’t know in advance whether a given part of your route is well fleshed out, although all main routes are covered. Drive and Score: While the points don’t matter, you can see how you’ve accumulated more of them. I found that Waze crashed more often than any other GPS app I’ve tested—and I’ve tested most of them. But reviews on the App Store, which will generally tear into shreds any app that crashes frequently, don’t seem to mention it. Maybe Waze just doesn’t like me? Waze is free, so there’s no risk in trying it out to see if it meets your particular driving needs. Take note, though: your mileage will vary.